The TV signals are first sent out by a tower. The waves are sent out as far as the tower can send them. The distance of the TV from the tower will determine the quality picture that you get on the TV. The antenna on the TV might have to be moved to a different position to get the right signal from the tower. 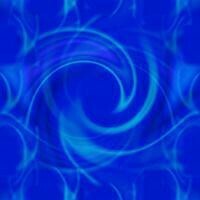 If the antenna is facing the opposite way of the signal, the quality of the picture will not be good. 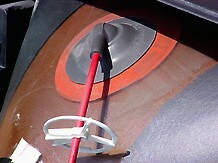 A television first has to have an antenna to receive the TV signals in the air. 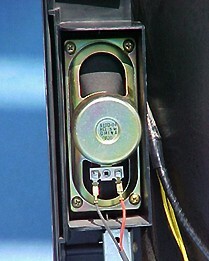 The electricity can be transferred to the television through an electrical socket or batteries. The electricity flows through the TV and turns on the power, so the antennas can receive the television waves from the air. The average voltage used to run a television is about 120 volts. 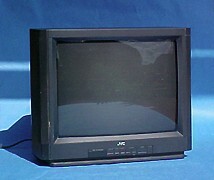 This flat TV screen is the front of the cathode ray tube called the shadow mask. The screen is coated with phosphor which glows when struck by the beam. 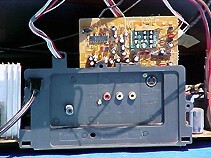 Here is the back of the television, usually covered by a plastic cover to protect the user from the electronics. 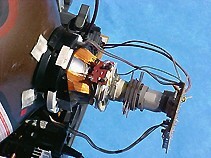 Steering coils or copper windings create magnetic fields inside the tube. One of the coils creates a magnetic field that moves the electron beam vertically, and the other set of coils moves the beam horizontally. 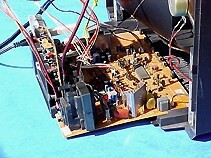 A circuitry board is used to help control various settings on the TV. 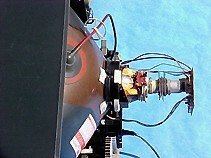 RCA connections (red, white, and yellow) can be used to attach a VCR, DVD, or computer game units. 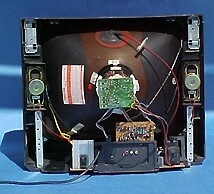 Stereo televisions have two speakers to amplify the sound.